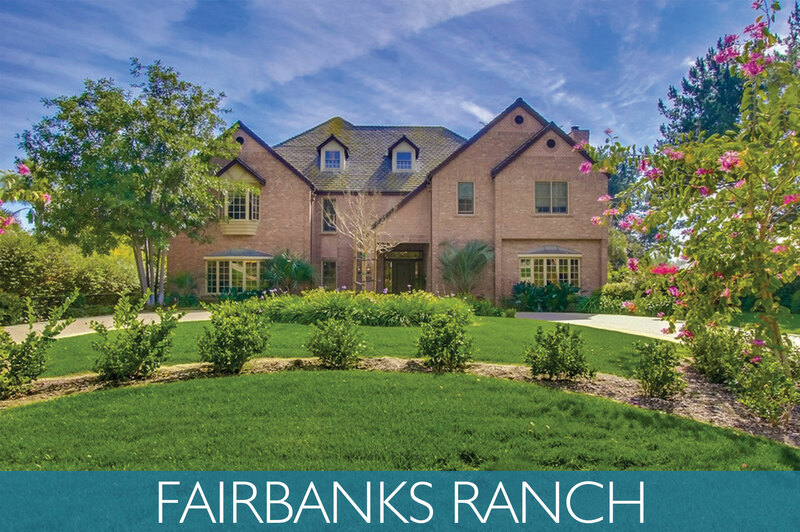 Fairbanks Ranch is a premier, gated, 24-hour manned security, residential community in Rancho Santa Fe, California. It is comprised of exclusive estates, wide private boulevards, and mature and well groomed landscaping. It boasts over 75 acres of park-like grounds and the average lot size is 1.2 acres per home. View more about Fairbanks Ranch on Pinterest! Pristine Lake with Bird Sanctuary Island, Catch-and-Release Fishing, and Paddle and Row Boats. The Walking Distance Around the Lake Equals 0.6 Miles. Beautiful Clubhouse with Dark Stained Mahogany, Fireplace, Wrought Iron, and Mexican Tile. Meticulously Groomed Park with 5 Tennis Courts (Three Lit and Open Late. Tennis Professional Offers Private Lessons for Adults and Children. Community Tournaments Offered Throughout Year. ), Barbeque and Picnic Area, Volley and Basketball Courts, Jungle Gym, Etc. 24 Hour Security with Two Main Entrances and Six Private Entrances for Residents Only. Fairbanks Ranch Country Club was established in 1984 on the site of the Olympic Equestrian Endurance Event. It is a distinctly private, member-owned Club consisting of the most prominent business, professional, athletic, and social personalities of the community. It is the mission of the Club to be an outstanding, full-service, private country club serving its members, their families, and guests in a special, friendly manner that is synonymous with the best clubs in the nation. A neighbor of the peaceful, beautiful, and prestigious community of Rancho Santa Fe, the Club is located near the Pacific Ocean, Del Mar Race Track, and all of the attractions and conveniences of San Diego. The luxurious clubhouse offers a wide variety of activities, fine dining options, and special events. The clubhouse is open Tuesday through Sunday and offers several dining venues including the Main Dining Room, Sunset Terrace, Members Grille, Lounge, and Snack Bar that provide a comfortable, friendly, and relaxing atmosphere for Members and their guests to enjoy. Tennis enthusiasts enjoy play on eight tennis courts, including one clay-composite surface. Five courts are lighted for night play. Lessons and team play are available to players of all ages and playing abilities. Facilities include a pro shop, lounge, fitness and stretching area, locker rooms, and croquet lawn. The picturesque 27-hole golf course was designed by Ted Robinson, Jr. and is broken down into 3 very walkable courses including The Valley, Lakes, and Ocean. Five tee areas provide golfers the opportunity to make their round as challenging as they’d like.